Guess what I'm doing today? Kicking off the blog tour for the upcoming book by Lindsay Clendaniel of Scoop Adventures! There may be snow outside my window, but ice cream never goes out of season. Let me give you a little bit of background on the book, and then I'll tell you why the ice cream that I'm sharing today fits me like a glove. Okay, so Scoop Adventures is the title, but it's not the full title. The Best Ice Cream of the 50 States is also part of it. The book is divided into regions, by chapter, in which Clendial shares the story of where each particular recipe originates. Although I'm guessing that a trek across the country in search of the best creameries and exciting flavors would be the ideal roadtrip, if that's not possible, this book comes in a close second. I've highlighted a few of the recipes from the book that are tops on my "to make" list below, but really there's not a single flavor that I wouldn't love to try from the book. Each one is unique and inventive. 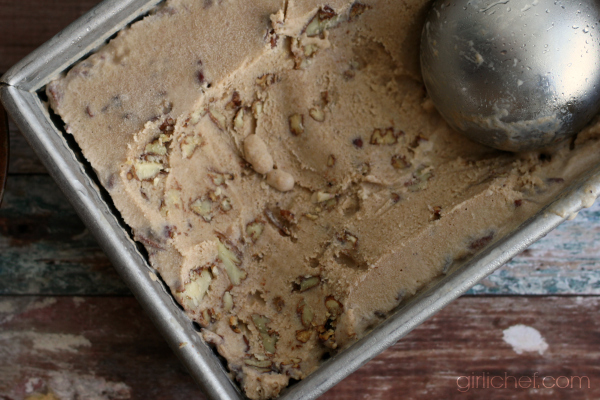 It's a good thing that I keep my ice cream canister in the freezer year round. Now, I'm partial to the Midwest. If you hang out around here at all, you know that I grew up in Michigan and Indiana - and still reside in Indiana today. The first thing I did after opening this book was turn to The Mouthwatering Midwest chapter. I was on the hunt for Blue Moon, my favorite flavor of ice cream since I was a kid. There was this little shop near the beach in South Haven that I always looked forward to ordering it from when I visited my grandma. It's not in here - so, I'll get on that one. But one of the recipes in this chapter happened to fit me nearly as well. That would be the ice cream that I'm sharing today. 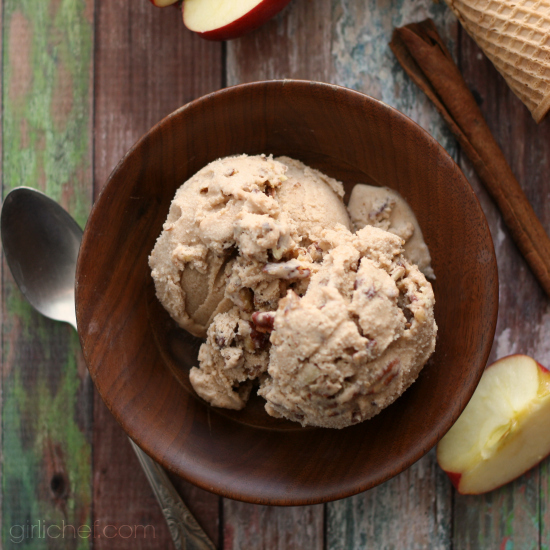 This Apple Butter Rummy Pecan Ice Cream originates with an Ice Cream Shop called Hartzell's, located in Bloomington, Indiana. The owner was inspired to make it when he tried homemade apple butter for the first time (an Indiana staple - especially in Amish country). It just so happened that while he was developing this flavor that's laced with warming spices, his buddy brought over a bottle of Appleton Jamaica rum. Well, you can probably guess what happened from there. 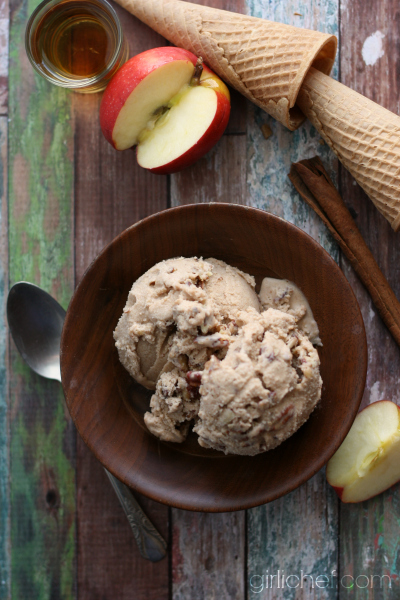 Yes, an ice cream flavor that succeeds in warming you up, even when it's cold outside. I speak from experience. So, for this Midwest girl who lives in Indiana, is partial to apple butter, and is always lacing her food with some sort of booze, this recipe was a perfect fit. Recipe from Scoop Adventures by Lindsay Clendaniel (Page Street Publishing; March 2014). Printed with permission. To make the ice cream base, fill a large bowl with ice water. In a small bowl, combine 2 tablespoons (30ml) of the milk with the cornstarch, whisk and set aside. In another large bowl, add the cream and set aside. Combine the remaining milk with the brown sugar, corn syrup, vanilla bean scrapings and pod, apple butter, cinnamon, allspice, cloves and sea salt in a medium saucepan and place over medium heat. Bring the milk mixture to a low boil. Cook until the sugar dissolves, 3 minutes. Remove the milk mixture from the heat and gradually whisk in the cornstarch mixture. Return to a boil and cook over moderately high heat until the mixture is slightly thickened, about 1 minute. Remove from the heat and pour into the large bowl with the cream. Carefully remove the vanilla bean pod. Set the bowl in the ice water bath to cool, 20 minutes, whisking occasionally. Cover and refrigerate until well chilled, at least 4 hours or overnight. To make the salted pecans, melt the butter in a heavy skillet over medium heat. Add the pecans and stir to coat. Sauté until the pecans begin to brown, about 5 minutes, stirring occasionally. Stir in the salt and remove from the heat. Cool completely before adding to the ice cream. Once the ice cream base is chilled, add the rum, adjusting to taste. Pour into an ice cream maker and churn according to the manufacturer’s instructions. When churning is complete, gently fold in the salted pecans. Transfer to a freezer-safe container and freeze until firm, at least 4 hours. Prefer the flavor of peaches? 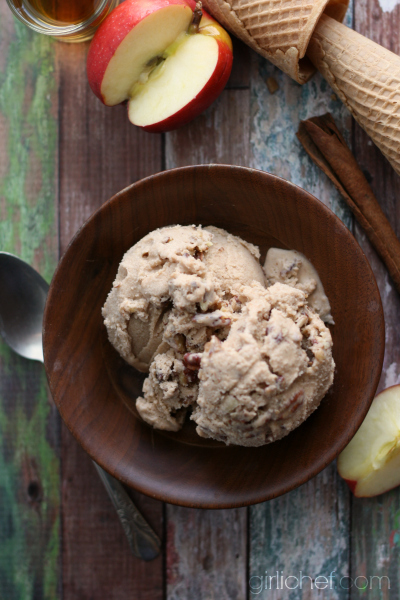 Substitute peach butter and bourbon for a sweet Southern-inspired treat. If you are using spiced apple butter, omit the cloves and allspice from the recipe. I didn't have Appleton Jamaican Rum, so I just used what I had. fun features: I love the individual introductions to each recipe in which Lindsay explains where in the region it originated, her inspiration, and/or a bit of history behind the flavor. 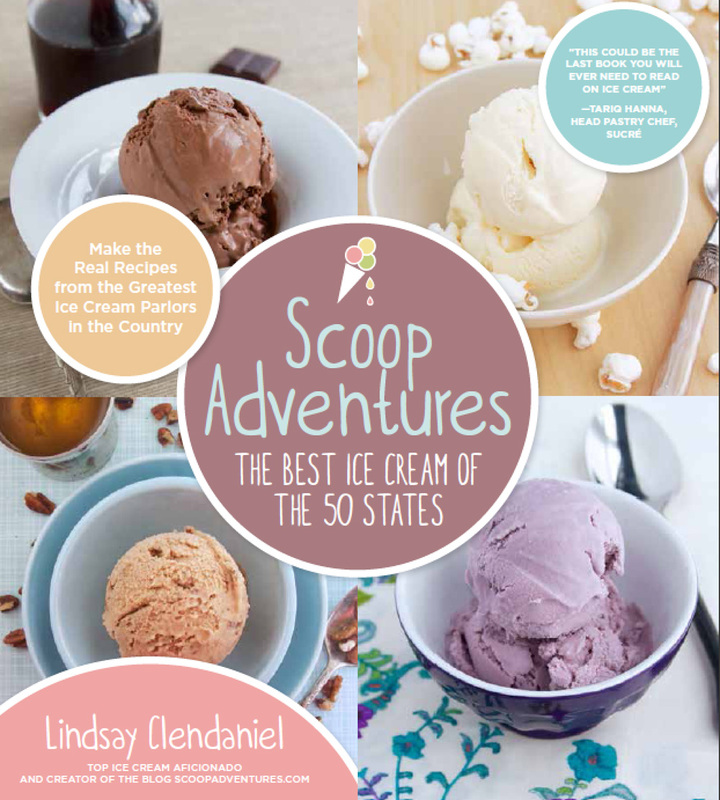 about the author: Lindsay Clendaniel is an avid ice cream maker who blogs about her adventues at ScoopAdventures.com. Her blog and recipes have been featured online at the Huffington Post, Redbook Magazine, Gourmet Live and Sweet Home, and the website of the award-winning confectioner Sucré. As a former resident of New Orleans, Lindsay wrote regularly as the New Orleans Dessert Examiner. Lindsay now lives in Annapolis, Maryland, with her husband, two cats and two ice cream makers. Would you like to win a copy of Scoop Adventues? The publisher is generously providing another copy to one of my readers! Simply answer this question in the comment section below: What is the most adventurous flavor of ice cream that you’ve tried so far? Be sure to record that you've answered the question in the rafflecopter widget to open up more optional entries! This contest is open to all residents of the USA and Canada. Submissions will be accepted through 11:59 pm ET on Monday, March 24, 2014. Winner will be chosen by random draw and notified via email within 48 hours of the close of the contest, and given 24 hours to respond. If no response is received in that time frame, a new winner will be chosen. Be sure to keep an eye out for more stops on the blog tour for Scoop Adventures. You'll see more of the amazing ice cream recipes from the book, and have more chances to win your own copy! I received a free copy of this book from the publisher. All thoughts stated in this post are my own. This post contains Amazon affiliate links.